Salon Coy is a high-end salon that has been offering a unique experience for the past 3 years by creating an environment and atmosphere desired by clients at a reasonable cost. It is situated in Bolton, Ontario and is regarded as the city’s top studio. They influence their staff to be creative and education is important in fostering the creative culture within their business, which they see as a valuable asset in client retention. 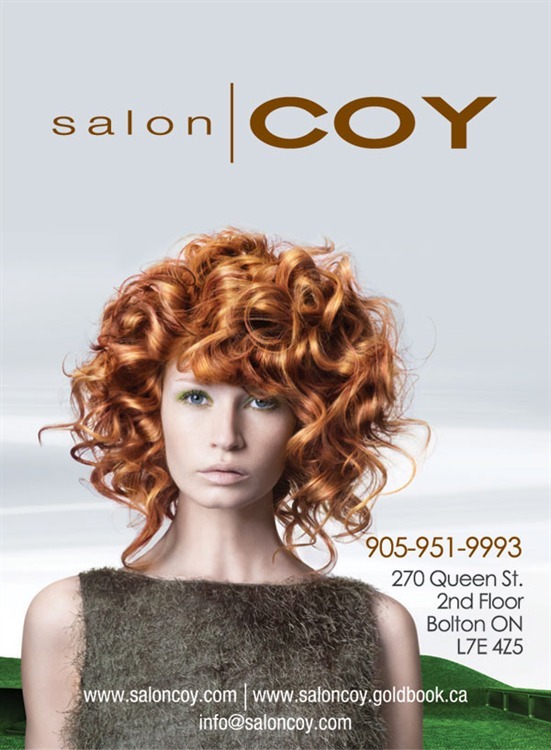 Salon Coy competes in a highly competitive market and being seen, retaining their clients and staying ahead in the marketplace is demanding. Salon Coy’s existing website was designed in Flash and with Flash websites SEO limitations they required something new to increase their online visibility. They also where interested in re-designing their logo to fit with the new concept of their website. With the company in the 3rd year of business customer acquisition was still important to fill up their daily schedule. They did not have any social media presents and due to the current buzz wanted to jump on board to reap the benefits of its marketing capabilities. Salon Coy also required the ability to update their site and make changes internally to keep costs at a minimum. To adhere to Salon Coy’s challenges, Mingle Media provided the proper direction and executed a flawless strategy, which proved to attain a healthy ROI. Our team designed to new logo for the Salon including redesigned their aging Flash website with a web 2.0 site. It including the proper search engine optimization to create visible for all major search engines at the same time provide easy of navigation and readability to site visitors. All relevant social media sites sign ups were established and the website promoted through these avenues. Mingle Media assisted in creating an online and offline referral program to draw new customers to the Salon and generate email lists for promotional campaigns. Mingle Media also provided them a content management system (CMS) to make internal changes to their site without having to find external assistance. New corporate identity increased brand image and resulted in improved customer retention. Client base increase by 2.6 times in one year. Salon Coy needed to hire new stylists to keep up with demand. The online and offline referral programs where crucial in increasing clientele and made it beneficial for clients to bring friends to the Salon. Web analytics were provided to their online referrals to monitor results and judge effectiveness. It was easy to manage and update the site when required due to the new content management system (CMS) that was included. minglemediagroup@ 2000 - 2019 © Division of 7772980 Canada Inc.